It’s worth mentioning that video marketing is the lynchpin of the digital advertising world. How do I dare to say this? According to a recent HubSpot article ,“About 58 percent of B2B buyers saw videos in 2014 to make a buying decision. 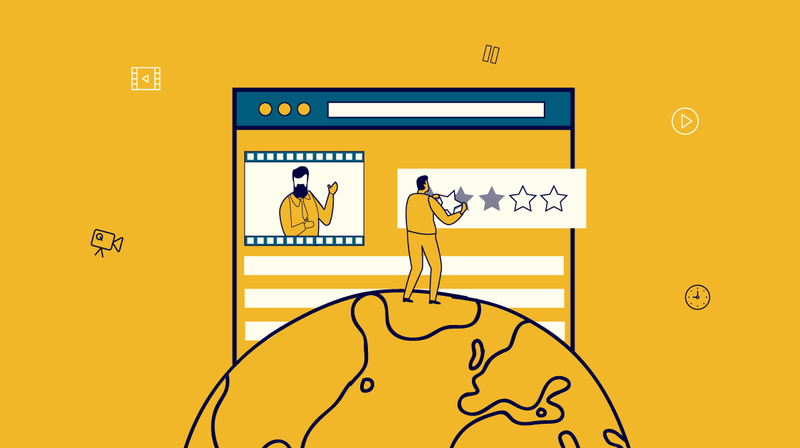 Moreover, 95 percent of buyers prefer shorter formats for content, and 86 percent of them want on-demand access.” This clears that viewers look for actionable explainer videos. Simply, video marketing has become a trend that allows companies to portray their vision in the form of compelling visual storytelling. This post presents some of the best explainer videos so far viewers have checked in bulk to draw inspiration and make a decision regarding the purchase. Before I jump onto examples, first, I want to make you understand why the hack you need an explainer video. Why Every Startup Needs an Explainer Video? It generates results faster than a website. It would act as a token for your business process. Videos allow you to fill any form, for instance, whenever you fill your startup profile in angle. Co, Techcrunch, etc., there is always an option to post your video. A sixty seconds video is equal to a thousand page collateral. Indeed an explainer video is better at driving more customers. Want an edge over your competitors? An Explainer Video is your solution. Want to raise funds? Investors look into your video before giving an appointment. It plays a vital role in SEO by increasing your website average visiting time. Post a video on your website homepage now! Simple but interactive:- Don’t stretch it long. Keep it a maximum of 60 seconds. Be Specific:-Don’t beat around the bush. Keep your approach straightforward to hook up with your audience. Demo your startup:- Skim over your app features for a better understanding of a viewer. Problem & solution:- Viewers expect solutions to their problems. Make sure your video skillfully express your concern and offers a solution that set them into action. Call to action:- At the end of the video, remember to appeal for your app download or subscribe or register to your audience. So these are the prerequisites for every explainer video that you need to focus on whenever you use it for your marketing purposes. Keep your video compelling enough to hold your target audience and get your brand the status you have always aspired for. Following are the examples of thoughtful explainer videos that have raised the level of animation while giving new ideas to present products and services better. Now, it’s time to discuss the videos that have set new benchmarks in the world of animation. It goes without saying that Hubspot is a leader in inbound marketing. What makes them a pioneer in marketing? One fundamental factor that contributes to its success is powerful explainer videos. The idea is the same that is hitting on the consumer’s problem first, then offering a solution. The script is free of fluff and ends within three minutes. While crafting an explainer video, you need to focus on your brand’s voice. Any diversion from a user perspective can boggle down the goal behind the making of a video. This is what the speaker in this Sonic Box has taken care of. The visuals explicitly describe the utility of the file-sharing service, particularly in the way that it blends well with your techno-culture. It convinces viewers about sending and accessing files anywhere and anytime. It uses visual metaphor and humour to keep its audience engaged while addressing their problem in a good way. PooPourri and Dollar shave club have common reasons for their success as both have the same styles. Though its video displays live action, the video makers have even taken advantage of animation to show the working of PooPourri. Moreover, the big green button clearly prompts a user to take action. Trying to match with this type of humour can be hard; it’s better to go for a subtle one. When it comes to the video making of Coca-Cola, a viewer expects an immense creative effort along with curated content that gives a virtual taste of its drinks. The brand truly satiates the taste buds of viewers using centralized themes that run throughout the video. Following the whiteboard style, this video is visually stimulating yet informative. It gives you required information as it has taken care of only necessary visual stimulus. Pinterest has raised the expectations of viewers with this video. By stating the video’s length, in the beginning, and tailoring this simple how-to video to their audience’s requirements, Pinterest was able to portray itself as a right platform to pin images of any type. Crazy Egg, a heatmap tool has recently come up with a video that shows why your website has a higher bounce rate, was crafted by the folks at Demo Duck. By sticking to problem/solution animation along with their app’s screen captures, this video has safely held a number of viewers. Marketers become sceptical when it comes to planning for a marketing campaign as it could make or break a brand. Therefore, they hunt for the best marketing strategies that could highlight the features of their products. We all know that marketing is an undeniable truth then why not go for the best? If you want to experience the best of marketing, try explainer videos. Animated explainer videos are soon going to sweep across all sectors as it has the power to drive audience and convert them to customers. Being a marketer, you need to understand who your target audience is, its requirements, problems and finally what role your services play in solving its problems. This would give an idea regarding your prospects and how you can involve them in your business. Psychologically, a person tends to learn more visually then orally. Here you get the answer regarding a marketing campaign. Rather than posting a number of blogs stuffed with exaggerated content, get down to explainer videos. Take a step towards visual learning and get ready to see the magic.